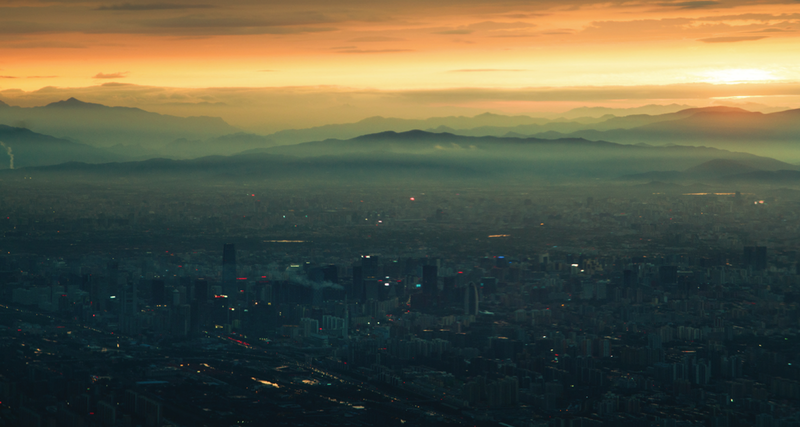 Photo: Jonathan Kos-Read, “Above Beijing,” Beijing, China. Accessed from http://flic.kr/p/qjMDxv. Creative Commons license available at https://creativecommons.org/licenses/by-nd/2.0/. No changes were made. Over two million people die every year in China from polluted air, and hundreds of millions more suffer much shortened lives.5 As cities like Beijing grow, vehicle exhaust, factory emissions, and the burning of firewood and trash create dangerous concentrations of particulate matter in the air (see figure). Certain realities that would have been unthinkable a generation ago – pedestrians and motorists in respirator masks, children with year-round bronchial coughs – are now considered normal, inescapable facts of modern life. Even in the most optimistic scenario, making China’s air safe will take decades.10 Staying the course with environmental reforms, especially given the competing imperative of economic growth, will be difficult. The momentum for change is unmistakable, however, as is clear by the proliferation of websites, smartphone applications, and media sources that provide pollution forecasts. Graphic: Created using data from reference 11. 1. Andrews, Steven Q. 2011. “Beijing’s Hazardous Blue Sky.” China Dialogue, May 12, 2011. https://www.chinadialogue.net/article/show/single/en/4661-Beijing-s-hazardous-blue-sky (accessed March 15, 2015). 2. Andrews, Steven Q. 2008. 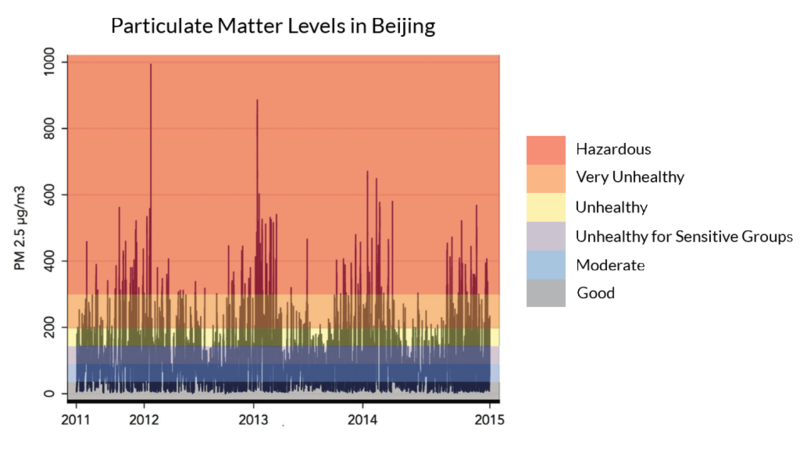 “Inconsistencies in Air Quality Metrics: Blue Sky Days and PM10 Concentrations in Beijing.” Environmental Research Letters 3(3). doi:10.1088/1748-9326/3/3/034009. 3. Wong, Edward. 2011. “Outrage Grows Over Air Pollution and China’s Response.” The New York Times, December 2, 2011. 5. Institute for Health Metrics and Evaluation (IHME). 2013. China Global Burden of Disease Study 2010. Seattle, United States: IHME, 2013. 7. Batty, Jonathan. 2015. IBM Global Labs. Interview by Bapu Vaitla. Phone interview. March 17, 2015. 8. “Tighter Air Quality Monitoring in Beijing.” 2011. Xinhua News Agency. China Daily, November 7, 2011. http://www.chinadaily.com.cn/china/2011-11/07/content_14052527.htm (accessed March 15, 2015). 9. Spegele, Brian. 2014. “China Moves to Bolster Air Pollution Control Law.” The Wall Street Journal, November 26, 2014. http://www.wsj.com/articles/china-moves-to-bolster-air-pollution-control-law-1417011241 (accessed March 15, 2015). 10. Xin, Zheng. 2014. “Beijing Expects Healthy Air by 2030.” China Daily, July 2, 2014. http://www.chinadaily.com.cn/china/2014-07/02/content_17635872.htm (accessed March 15, 2014). 11. United States Department of State. 2015. “Beijing Historical Data.” Mission China: Beijing. http://www.stateair.net/web/historical/1/1.html (accessed April 15, 2015).